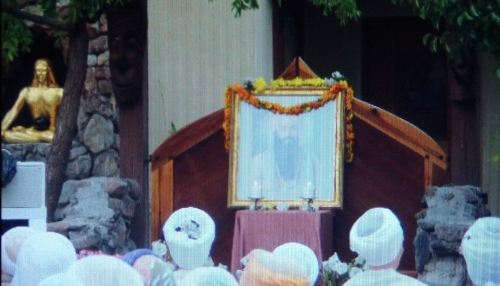 Sikhs wake-up to the reality of SikhNet's secret Yogi Bhajan agenda to subsume Sikhi into 3HO "Bhajanism"! The first image shows Yogi Bhajan’s wife, Inderjit Kaur Puri, two sons, Ranbir Singh Bhai and Kulbir Singh Puri, and daughter, Kamaljit Kaur Kohli, and some of his followers sitting in front of Yogi Bhajan’s garlanded photograph with the swami leading the puja. 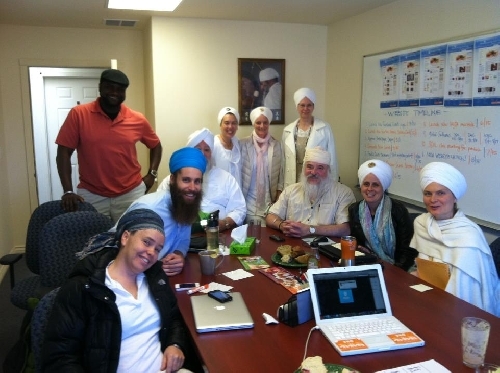 SikhNet asks for volunteers to help censor Sikhs who oppose Yogi Bhajan's tantric yoga ! "....it is necessary to edit out negative comments..." says SikhNet! Do Sikhs want a director of SikhNet who uses the fingernail clippings of a dead evil yogi as a "magic talisman" ? Sikhs must read how Guruka Singh of SikhNet kept Yogi Bhajan's fingernail clippings as tantric talismans to attain sidhi powers! The story by Guruka which was posted on the 3HO website yesterday is disgusting and an affront to all Sikhs! 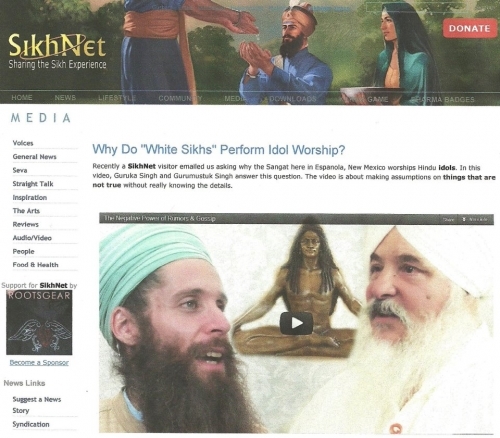 If you had any doubt of the anti- Sikh practices at SikhNet then here is definite proof from the horse's mouth! These Yogi Bhajan people are either delusional or under the tantric spell of Yogi Bhajan, maybe both. SikhNet's main office is attached to the same building not more than 20 feet from the golden idol of Baba Siri Chand and the mural featuring the Christian virgin Mary, mother of Jesus. (1) A Sikh of the Guru should not have any faiths in Brahmanical monasteries, idols, pilgrimages to holy rivers, gods and goddesses, fasts, Brahmanical ceremonies of image worship (puja and archa), nor should a Sikh believe in Tantric mantras and Yantras nor go to Brahmins and pirs for amulets, talisman or seeking omens, nor submit to the Hindu sacrament of Gaytri and Tarpana. (2) A Sikh is the Khalsa who has dedicated his body, mind and wealth to the Supreme Being. (3) A Sikh should NOT wear any sacred thread of the Hindus. He should not perform any Hindu rites or ceremonies. A Sikh should perform all ceremonies according to discipline of the Sikh Gurus by offering prayers (Ardasa) before the Lord. (8) A Sikh does NOT go to Hindu places of pilgrimage for salvation or mukti. (9) A Sikh does not practice Yoga asanas and other feats of penance associated with Yoga of any sort. (15) A Sikh does not have any faith in Brahmanical, Vaishnava or Shaiva Deities. (16) A Sikh pays NO attention to Yogis who...put on any other garb or robes. For greed, lust, cheap popularity they wonder from door to door. Their hearts are empty and their samadhis are sham. The true religion is the Religion of divine Love. (17) A Sikh should NOT follow hypocritical saints who are actually thugs in holy garb. (18) A Sikh should NOT worship any idols. There is NO God in stone images.